Superstar Krishna’s daughter and Mahesh Babu’s sister Manjula Ghattamaneni is making directorial debut with a film to be produced jointly by her husband Sanjay Swarup in association with P Kiran under Aanandi Indiraa Production LLP. 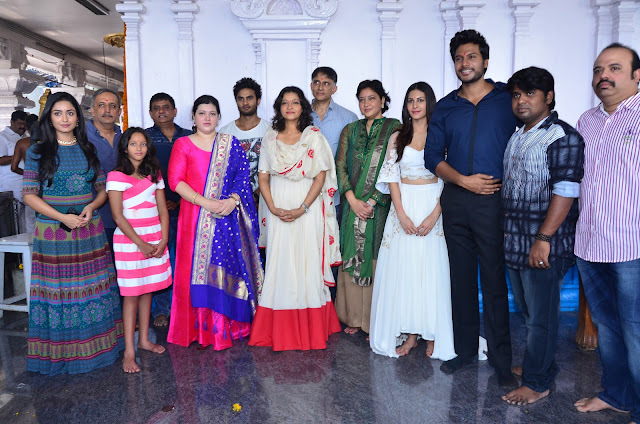 Sundeep Kishan, Amyra Dastur and Tridha Choudary are lead cast in the film that has been launched today with a formal Pooja ceremony at Film Nagar Daiva Sannidhanam Temple in Film Nagar. While Manjula's daughter Jahnavi Swarup sounded the clap board, Manjula herself directed the first shot and her sisters Padmavathi Ghattamaneni, Priyadarsini Ghattamaneni switched on the camera. “Manjula proved herself as a good actor and producer in films is now making directorial debut with a pure love story. Besides wielding mega phone, Manjula has also penned story and screenplay for the movie, wherein renowned writer Sai Madhav Burra is providing some wonderful dialogues. Talented young hero Sundeep Kishan will play lead role in the film that will have Amyra Dastur, Tridha Choudary in female lead roles. Principal shooting of the film begins in Goa from 20th of this month. We are planning to release the film during Dussehra season,” said producers on the occasion. Artists: Sundeep Kishan, Amyra Dastur, Tridha Choudary, Nasser, Adith Eswaran, Punarnavi Bhupalam, Jaanvi Swarup, Priya Darshi, Abhay etc.